Southland Under 19s Tom Sexton and Makayla Smith closed out the Oceanias in style wach with a silver and bronze in their respective men's points and women's points races. Meanwhile, Kiwi riders Lauren Ellis and Aaron Gate finished off four tough days of competition with victories at the Oceania Track Cycling Championships in Adelaide. The hosts dominated the elite keirin competition in both men and women but the New Zealand contingent fought back to win the finale points races in style. Ellis dominated to claim 33 points, finishing well clear of Australian Allison Rice and compatriot Georgia Williams. Gate enjoyed a brilliant battle with former junior world champion Tirian McManus in the men’s points race, pipping the Australian by just two points after the pair both put a lap on the field. Commonwealth Games gold medallist Annette Edmondson dominated the women’s omnium competition, winning all six disciplines with the improving Racquel Sheath promoting her long term chances for New Zealand to finish second. Yesterday she was third in the time trial and flying lap and second in the points race. The Kiwi riders missed out on the finals of the keirin competition won by former junior star Jacob Schmid while Stephanie Morton claimed an all-Australian podium in the women’s sprint. 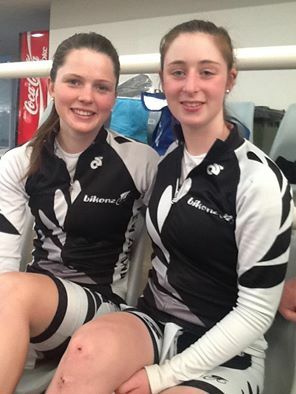 Palmerston North prospect Michaela Drummond won all three events today – the time trial, flying lap and points race, to claim the junior women’s omnium, and complete a Manawatu double with Campbell Stewart winning the junior men yesterday. The New Zealanders claimed the important qualifying points in key Olympic events, and return to their base in Cambridge tomorrow to prepare for the opening UCI World Cup next month. Women sprint qualifying: Stephanie Morton (AUS) 11.131, 1; Anna Meares (AUS) 11.185, 2; Kaarle McCulloch (AUS) 11.307, 3. Also: Stephanie McKenzie (NZL) 11.498, 5; Katie Schofield (NZL) 11.686, 7. Final: Morton 1, Meares 2, McCulloch 3. Also: Schofield 5, McKenzie 7. Keirin, men, round 1, heat 1: Eddie Dawkins (NZL) 1, Peter Lewis (AUS) 2. Heat 3: Andrew Taylor (AUS) 1, Braeden Dean (AUS) 2. Also: Sam Webster dnf (in crash). Heat 4: Jacob Schmid (AUS) 1, Matt Archibald (NZL) 2. Repechage 1: Ethan Mitchell (NZL) 1, Alex Radzikiewicz (AUS) 2. Round 2, heat 1: Matthew Glaetzer (AUS) 1, Emerson Harwood (AUS) 2, Andrew Taylor (AUS) 3. Also NZers: Mitchell 5, Archibald 6. Heat 2: Mitchell Bullen (AUS) 1, Peter Lewis (AUS) 2, Jacob Schmid (AUS) 3. Also: Dawkins 4. Seventh-12th: Dawkins 7, Mitchell 8, Archibald 10. Final: Schmid 1, Taylor 2, Bullen 3. Omnium women final: Annette Edmondson (AUS) 240 points, 1; Raquel Sheath (NZL) 187, 2; Elissa Wundersitz (AUS) 185, 3; Jaime Nielsen (NZL) 167, 4. Women Points: Lauren Ellis (NZL) 33 points, 1; Allison Rice (AUS) 24, 2; Georgia Williams (NZL) 19, 3. Men Points: Aaron Gate (NZL) 47 points, 1; Tirian McManus (AUS) 45, 2; Daniel Fitter (AUS) 21, 3. Men Keirin final: Derek Radzikiewicz (AUS) 1, Cameron Scott (AUS) 2, Conor Rowley (AUS) 3. Also: Hamish Beadle (NZL) 5. Women omnium final: Michaela Drummond (NZL) 217, 1; Chloe Moran (AUS) 206, 2; Tori Saunders (AUS) 185, 3.Women Points: Danielle McKinnirey (AUS) 20 points, 1; Ione Johnson (NZL) 11, 2; Makayla Smith (NZL) and Michaela Drummond (NZL) 10, equal 3. Men Points: Ryan Schilt (AUS) 45, 1; Tom Sexton (NZL) 37, 2; Hayden Dicocco-Grant (AUS) 27, 3.